Americans of the Volunteer 29th Infantry wading ashore at Marinduque, Philippines, 25 April 1900. John? Son of John Lewis and Jane Vaughan Lewis, born in Llanfoist, Wales in July 1847. Died 11 August 1902, Iloilo, Philippine Islands. Upon finding this information, I mourned for him. The notebook of Johns Family History has arrived. There is much to digest and sort through. There was a passing comment in the notes of Elsie Fern Johns Schneider (1892-1987) that Jane's son John by her first husband, John Lewis, died in the Philippines. It's not easy to search for military records even on Ancestry.com. And when I found it, especially with the report of interment, my heart nearly broke. We have no evidence that John Samuel Lewis ever married. He is single in the Nevada Census up to 1880. His mother died in 1890. And as a mature, single man, he apparently signed up and went to the Philippines. His Report of Interment card shows no next of kin. He only knew of his step-relatives in the Johns Family. If only he had known of the Vaughan Uncles, Aunts, and Cousins in Pennsylvania and Utah. I requested whatever additional military records there are from the National Archives. We'll see what they may do to further confirm or demolish this evidence. Part of the heartache in mourning a death of over a hundred years ago is to see the blank for "next of kin." John, you are not alone. You do have kin. And we hope to meet you one day. Your temple work will be done. Indeed sad. 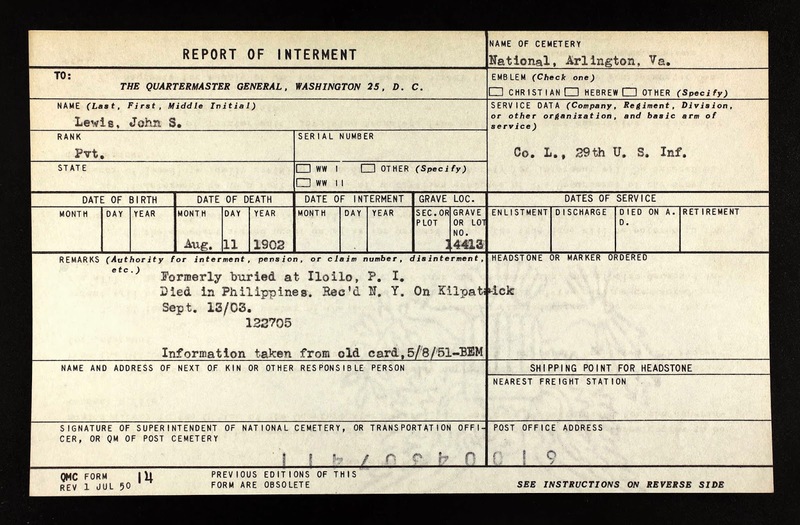 But please not that it is a report of interment, not internment. I thought at first that he had been in a Philippine prison camp rather than a Philippine cemetery. I hope you can find out more aobut him. Thanks, Laura, for the edit. Whoa! THREE of my Political Heroes all at Once! Daniel Wood in Ohio: Found! A-6 "Called to the Ohio!"